Bill Robinson is our Head Golf Professional and General Manager. 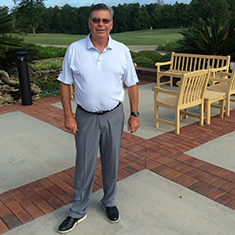 Bob Burk is our PGA Director of Instruction. The Kinderlou Golf Shop is fully stocked with a complete line of gloves, shoes, clubs, putters, golf apparel, equipment and accessories from Titleist, Footjoy, Mizuno, Donald Ross, Polo, Cutter and Buck and many more. Kinderlou Forest’s General Manager and Head PGA professional is Bill Robinson. After earning All-American honors at Shorter College Robinson started his golf career at the Atlanta Athletic Club and then played the mini-tour circuit for several years before earning his credentials as a PGA club professional. After 18 years at Highland Country Club in La Grange, Bill accepted the position as Kinderlou’s Head PGA professional in 2010. In addition to being awarded several merchandising awards by the Georgia PGA, Robinson is an accomplished player and instructor. He won both the Southern Texas assistant’s stroke play and match play titles, won the Heart of Dixie Pro Am Championship, is a three time Pot-O-Gold Champion, won the 1991 Georgia PGA Championship, and has played in several PGA Tour events. Bill and Peggy Robinson are one of many husband and wife teams who successfully share responsibilities at clubs throughout the country. The talented couple combine to create a great family atmosphere here at Kinderlou and will host a Kinderlou members’ trip to Ireland in June of 2017.